Aids Orphans Rising: Why should YOU get weighed and measured? Why should YOU get weighed and measured? 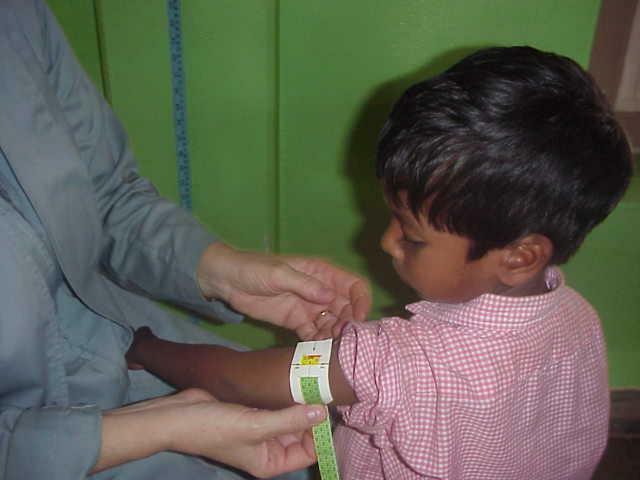 Getting measured can be of great importance to your health. From your weight and height have the doctor calculate your BMI, or do it yourself. If your BMI is greater than 25 it would be good lose a few pounds, do some exercises or begin a walking program. If it drops below 25 check the cause. It may be from weight or height loss. It might even be muscle loss from some medication you are on. Many diseases can be prevented or halted when a person has early knowledge of these changes. Children’s BMI should also be checked. Their BMI should be within range if low contact your doctor and if high you’ll have to get them out the door doing some fun exercises. Teach them something they can do for life. Looking at our AIDS orphans as a group they a all look like normal children, and they have a great energy level. When you measure them it tells a different story. See the little boy’s arm circumference measurement in this picture, the yellow going to red on the band? It indicates that he is malnourished and in need of good food. All of our children when they arrive at St. Lucy Mission are malnourished. In this world 23 children DIE from malnutrition every minute! The Sisters work very hard at helping the children achieve normal growth levels. When children are below normal levels they do not do well in school and are subject to catching many diseases. Malnourished girls grow up having difficulty giving birth and many have miscarriages. So it is good for all of us to keep up with our measurements. But most especially the children as malnutrition is the cause in more than half of all child deaths. Calculate your BMI yourself at http://www.halls.md/body-mass-index/bmi.htm and take action if needed. And do something good for the undernourished children TODAY! By the year 2010 there will be 25 million orphans from AIDS.